After the hullaballoo of opening, we were back to normal today, purple timetable running. But on a Wednesday we also work, so it was ducking and diving with trains going this way and that. They looked quite well filled, with lots of children visible - this is school holidays, after all. The 'Return to Broadway' headboards are a great success. The one in the picture above has made it safely back to Broadway. 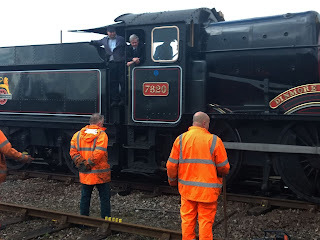 The loco crews are also enjoying themselves. 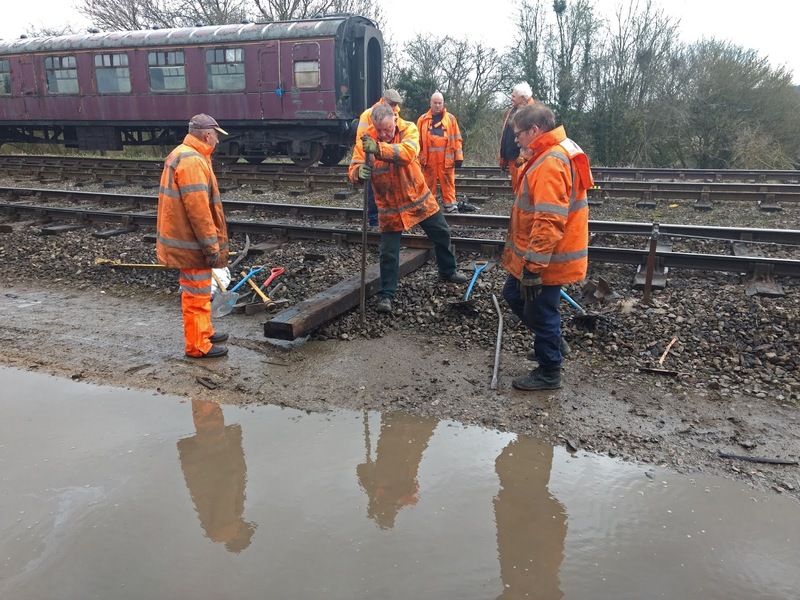 There's a new stretch of track, in excellent condition, and it's a bit uphill just before you arrive, so you could give her bit of welly. Only you can't. Just as you arrive at the Childswickham bridge, there is a 10 mph speed restriction. 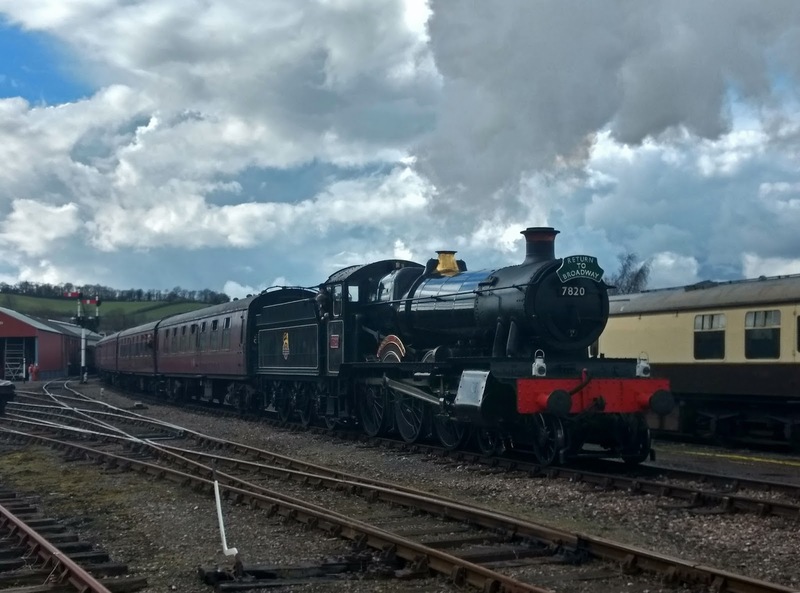 So there is no steam at all escaping from Dinmore Manor as she coasts up the hill, slowing down to respect the sign. Nice colours though, and lovely views of the Cotswolds around Broadway. Now back to th rubbish that we have picked up along the extension. 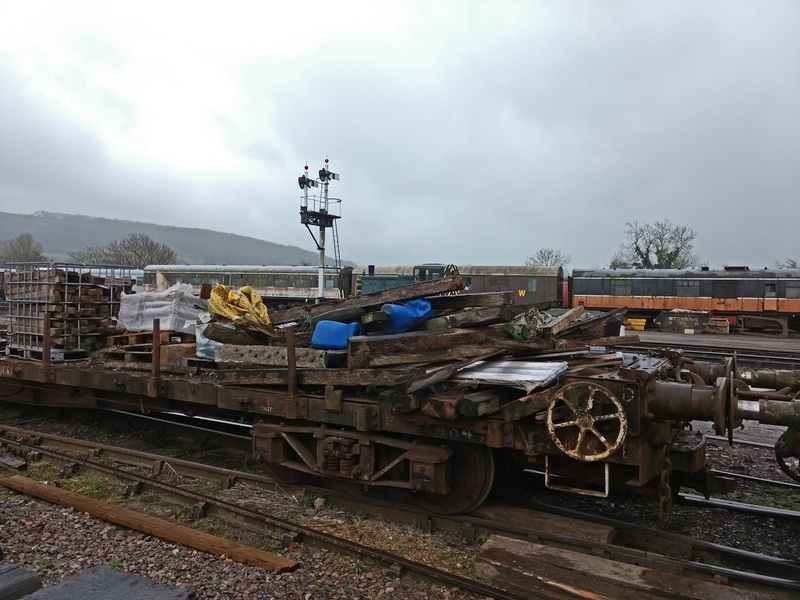 It's all been piled up on two bogie flats and parked up at Winchcombe. Your mission today, should you choose to accept it, is to clear these trucks of all the accumulated debris. 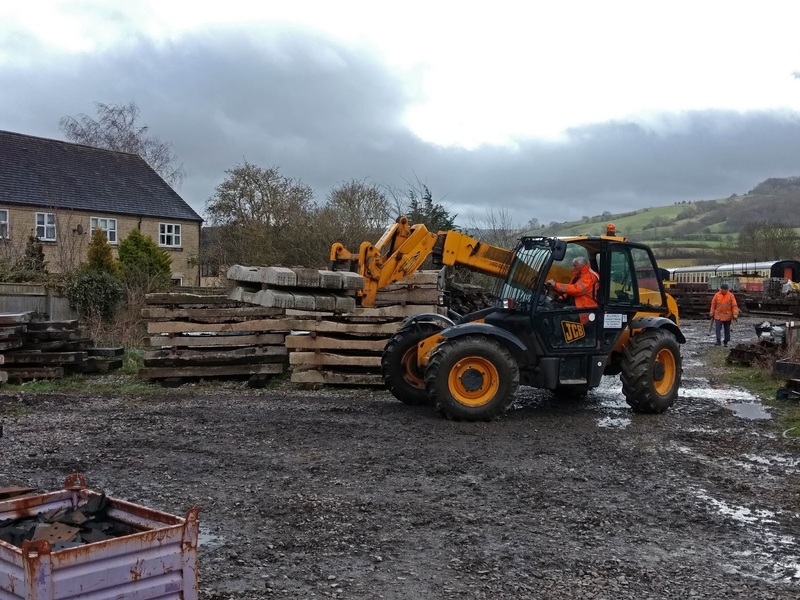 Dave P and Peter picked up this task as far as the Telehandler was concerned, with Dave D and your blogger on foot, clearing the metal scrap that was interspersed with the concrete sleepers left over. 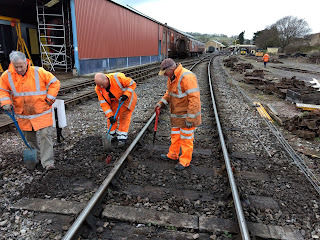 A second larger, indeed the principal team were busy spot resleepering the last few 100yds leading to Winchcombe from the Chicken Curve direction. 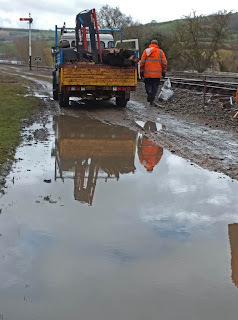 The first sleeper needing removal was right by the crossing here. We were just getting going when Dinmore came by with the first train of the day to pick up lots of passengers from CRC, where there seems to be quite a demand for trains to Broadway. We hear of queues forming at the booking office. Here is the sleeper in question. 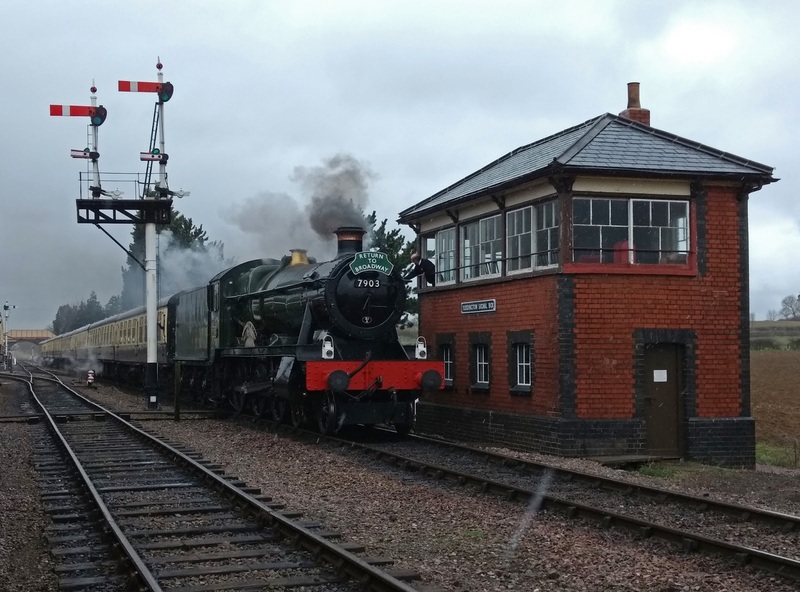 It's right in the running line, but we can replace it easily enough between trains, with the help of a lookout, attention to the signals and a timetable pinched from the booking office. In this area, possibly fitted with original sleepers laid in 1987, when they were aleady second hand, the sleepers are mostly GWR type 'through bolters'. 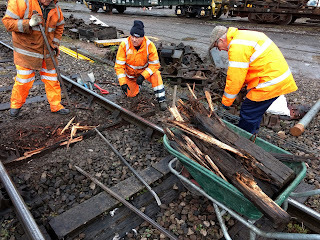 While normal people like the Southern Railway (ducks to avoid flying pieces of ballast) use a system of chairs with three screws secured top town into the sleepers, the GWR had two bolts instead, inserted from underneath, and then tightened from above with a nut. This was exposed to the weather and soon rusted on. Impossible to remove 30 years later. Now the only way to remove them is to split the sleeper in two. Should be easy enough, as it is meant to be rotten anyway. 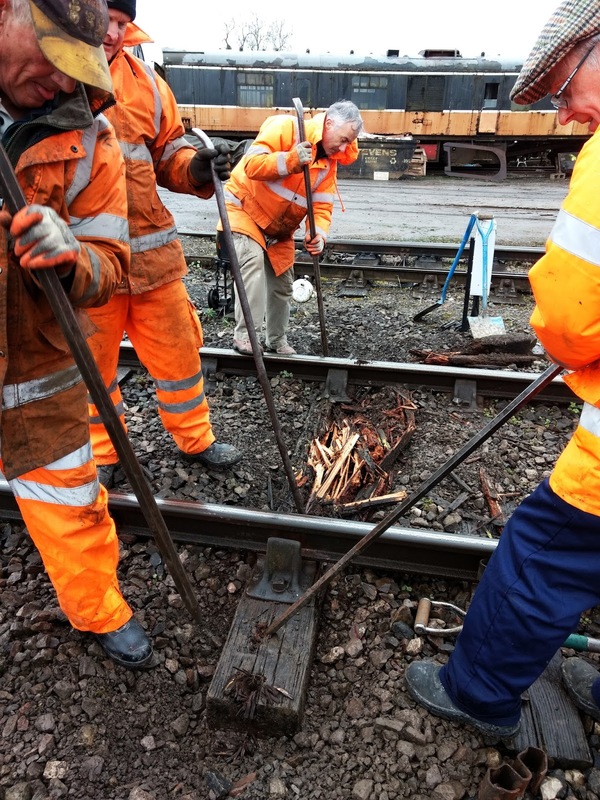 They may be rotten, those sleepers, but they sure resist any attempt to split and remove them. Eventually we resorted to using bars and wedges from above, and the heavy sleeper ended up as a kit of parts in a quickly summoned wheelbarrow. An hour later the new sleeper was in, equipped with nice 3 screw chairs from any other railway, except the GWR. The GWR through bolters are not scrapped, but put to one side for use by the 2807 group, who make up the boot scrapers that you can buy. We suggested charging extra for GWR ones (they also have all sorts of other pre nationalisation chairs) but this was felt to be too complicated for the retail outlets, so if you buy one (and support 2807) you might be lucky. 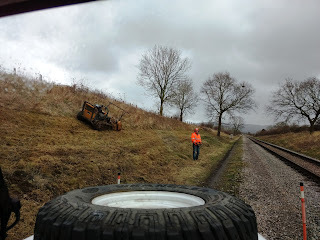 On a mission up the line in the Landie, we met this interesting remote controlled flail attending to our undergrowth. It's an amazing machine, and ideal for the brambles and young tree shots that grow up again so quickly. 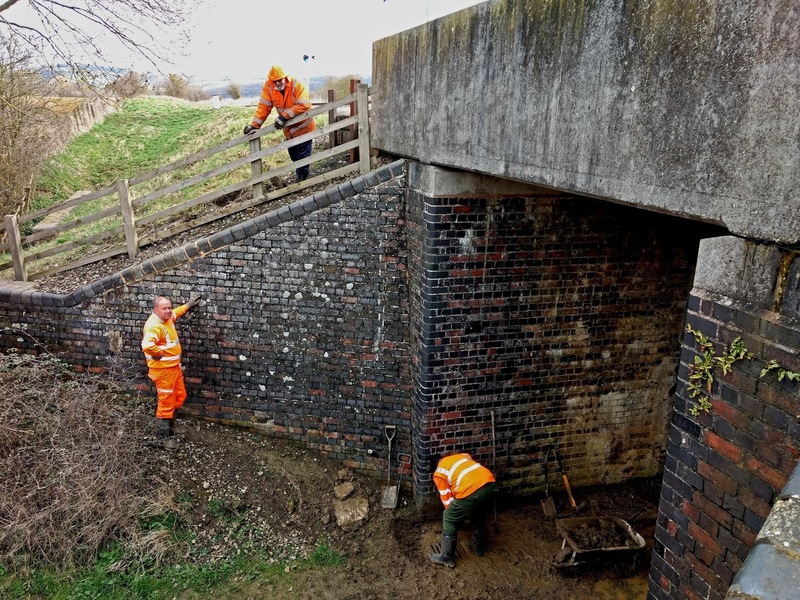 We also met Andy P and his drainage gang, working under this bridge on the (Defford) straight a little beyond Hayles Abbey halt. It's an occupation bridge, just used by a farmer but as the road is not tarmaced it soon clogs up with mud and grass, leading to blocked drains. 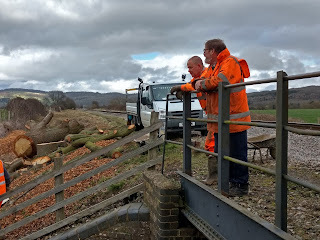 Here Alasdair is doing the hard work, while Andy P supervises and Dave D enquires politely whether they could perhaps please move their van, parked squarely on the roadway above. In fact Mr. Flail's truck was also in the way. Both said the same thing - help yourself, they key's in the ignition, move it yourself, we are very busy here. Here we must stop to congratulate Dave D, hero of the day. He moved both trucks, one with a trailer, and exposed himself to the dangers of a guard dog left in each. Andy P's guard dog was particularly keen. While it cowered in a corner as Dave climbed in and set off, it soon became a little more confident and eventually tried to lick him to death just as Dave was getting up speed. Those aren't guard dogs for nothing, you know. Lunch in the mess coach at Toddington.... time for a quickie (if you see what I mean) behind the DMU, where Foremarke Hall is just picking up the token from Toddington signal box. The risk here is that if you are late, you incur the wrath of Paul, and that is not something you want to incur. 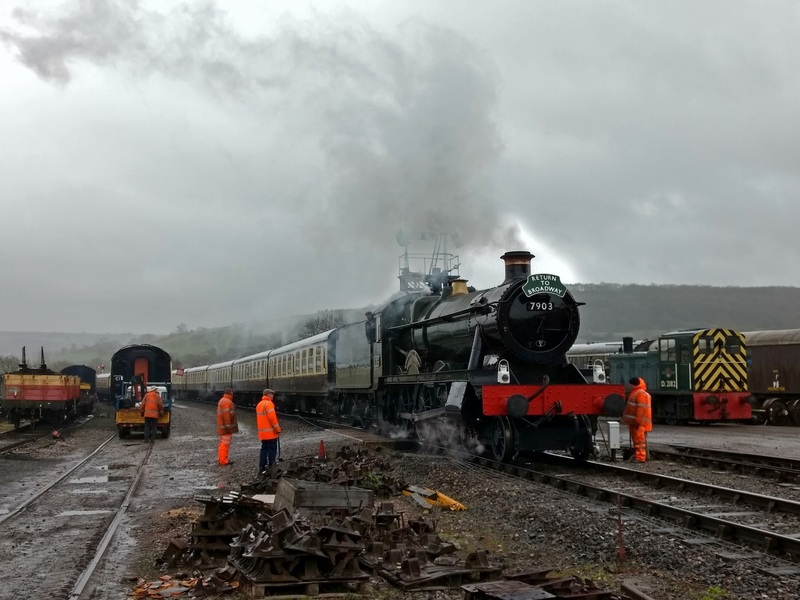 We took the risk, just so that you can see this GWR scene. We are after all, a 'living museum' as it says in our folder. 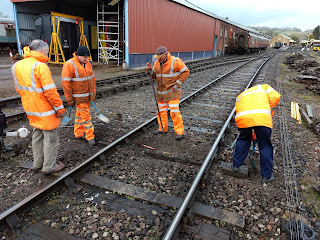 Back at Winchcombe, we had a bit of trouble coming up with a good, second hand sleeper for the sleeper changing team. All the rotten ones were on top, so the one you want is that one, the one near the bottom. There, see it? ... where a few minutes later Foremarke Hall left again for Broadway - see the 'Return to Broadway' headboard on the tender. Ominous skies? Yeah, we had them all day. It was wet again. In between all the fun we ran the Landie up and down and delivered second hand sleepers to the spot resleepering team, which was working its way towards the curve. There was a big lake here. 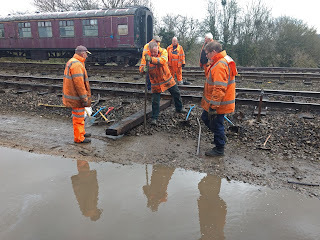 Although we are high up on an embankment here, the water no doubt collects due to the clay in the ground, dug out of Winchcombe cutting by the steam shovel in 1905. The resleepering team had to skip round this lake. When this big sleeper was dropped off the Landie, it fell into the lake with a large, pleasing splash. Here it is, fished out again, and pulled part way into the crib of the one they removed. 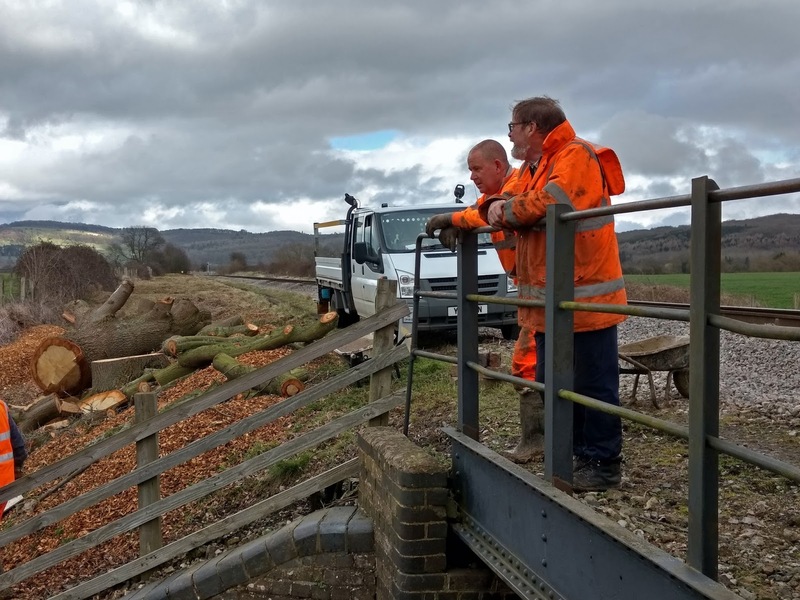 When Andy P and his team came back, we thought they'd be pleased at the sight of this 'drainage issue'. Not so - more work for them later on. At least they were gentlemen enough to drive slowly through the lake, and not splash us. Which cruel person would have this thought in his mind? 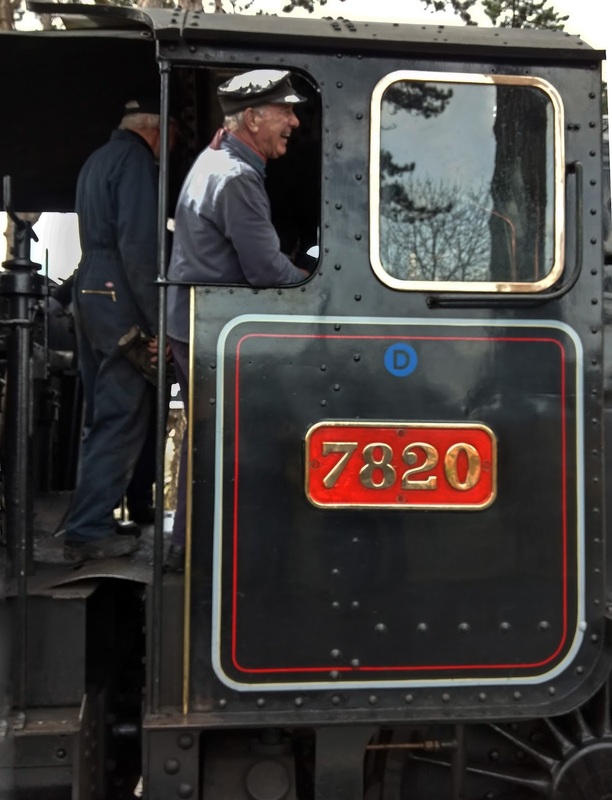 Then came Dinmore's last trip north for the day, out of CRC. We were still resleepering here when she came by. They look down at us, and we look up at them. Remember that on the Frost programme? 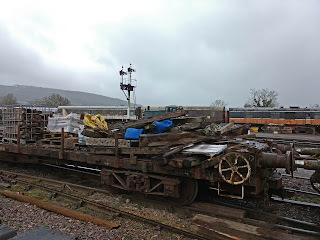 Round the back of this carriage siding there are some interesting things on the ground. 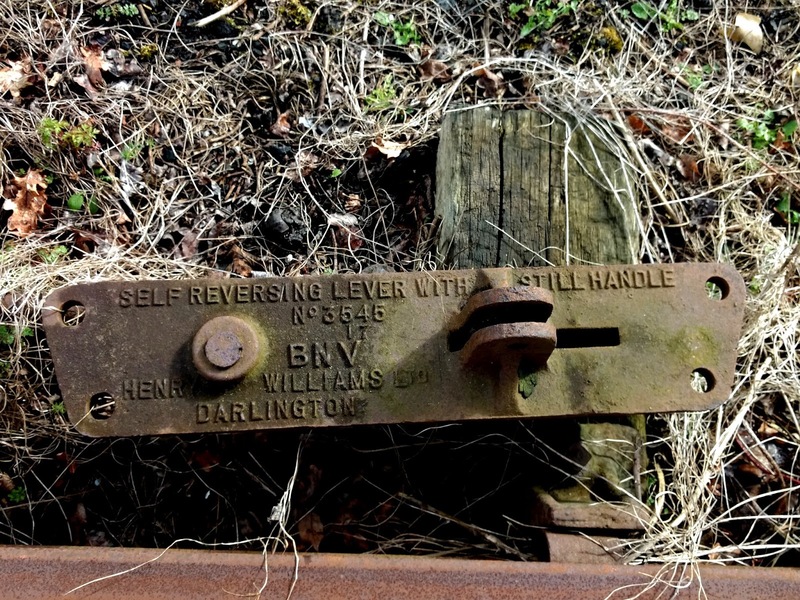 We rather liked this 'Self reversing lever with still handle', made in Darlington. 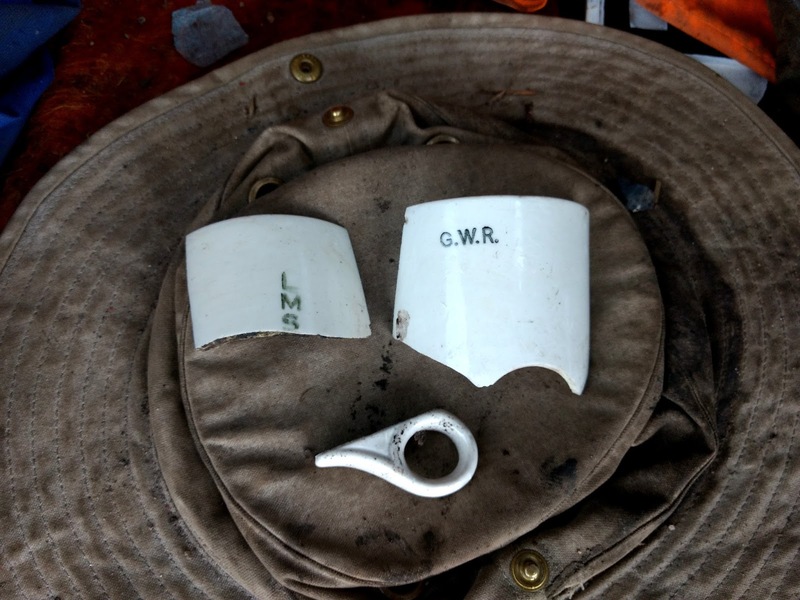 A hatful of crockery. GWR, and LMS. Chucked out of a race train parked here before the war? ''And what made you choose this occupation, Mr. P?'' '' It was the people you meet out here''. A final trip out to where Andy P was working earlier. This one is a steel bridge, but did you notice that the other one had a concrete deck? 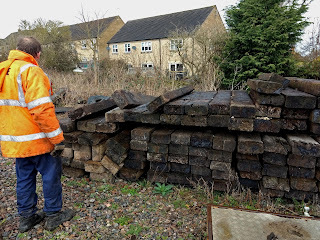 Evidence of bridge improvement works by BR before they gave up on the line. Should we replace our steel decks in the same way? Last but not least: the final train out of Broadway is replaced by a diesel in Toddington, before it continues to CRC. Here we see the blue Growler (or Tractor, which is it?) aka 37 215. 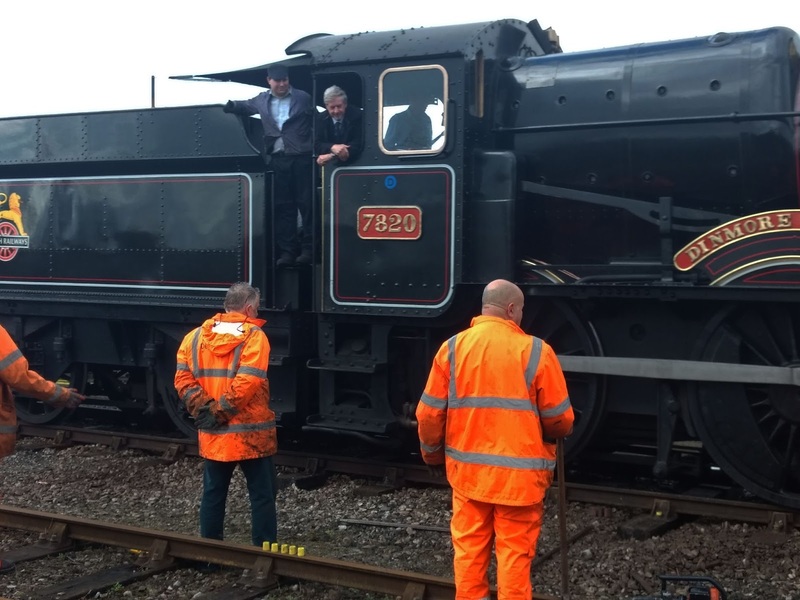 With its 8 carriages in tow, this could have been a train on this line before closure. 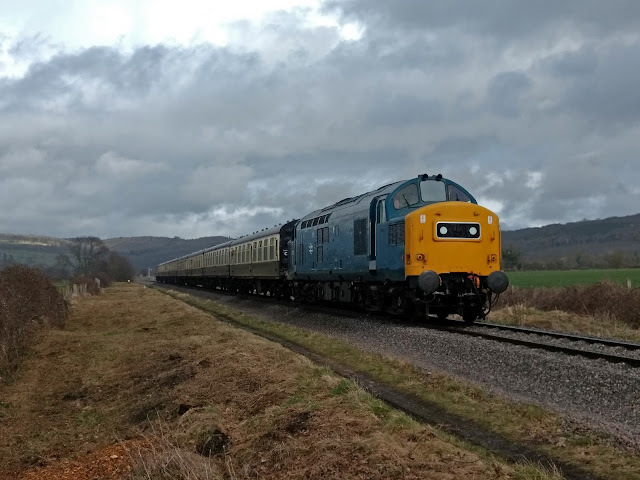 Taken just south of Hayles Abbey halt, with the Cotswolds edge in view behind. That's the beauty of our line. Hi Jo. 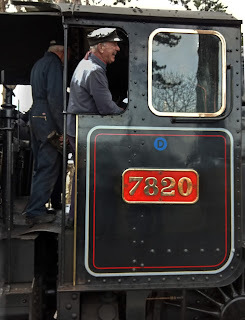 I took advantage of the reasonable weather on Tuesday to visit the extended railway. 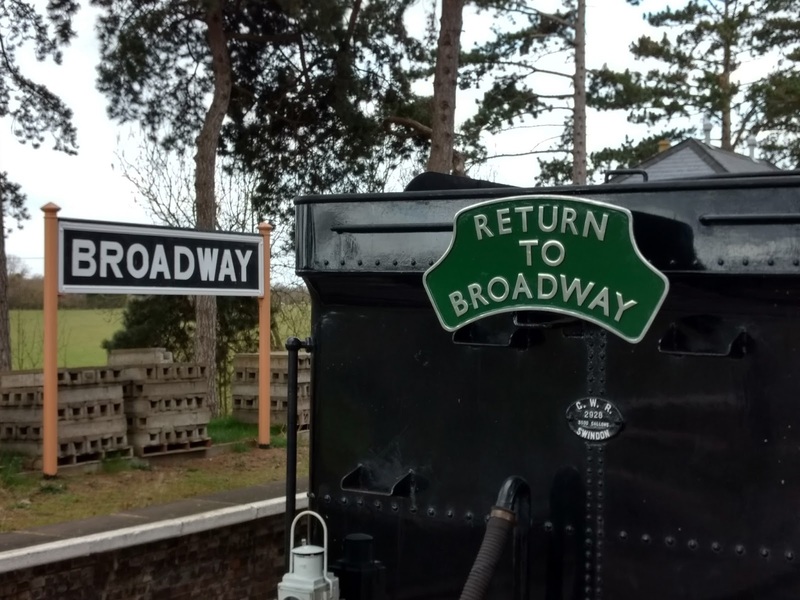 I must say I was impressed by Broadway - I half expected a bit of a rough and ready half finished station, but in fact the bit that is finished has been done to a high standard. The canopy is a masterpiece - well done the Loco gang! Could do with a few more benches though along the platform for us oldies to rest weary legs! Why is there a 10mph on the new track into Broadway? It's only on the approach to Broadway station just like the others, the rest of the extension is the usual 25 mph. The newly-laid track on the Broadway extension is very good quality - brand-new cwr on deep, fresh ballast. The ride is exceptionally smooth, even in coaches with BR1 bogies, which tend to let you know about every bump. 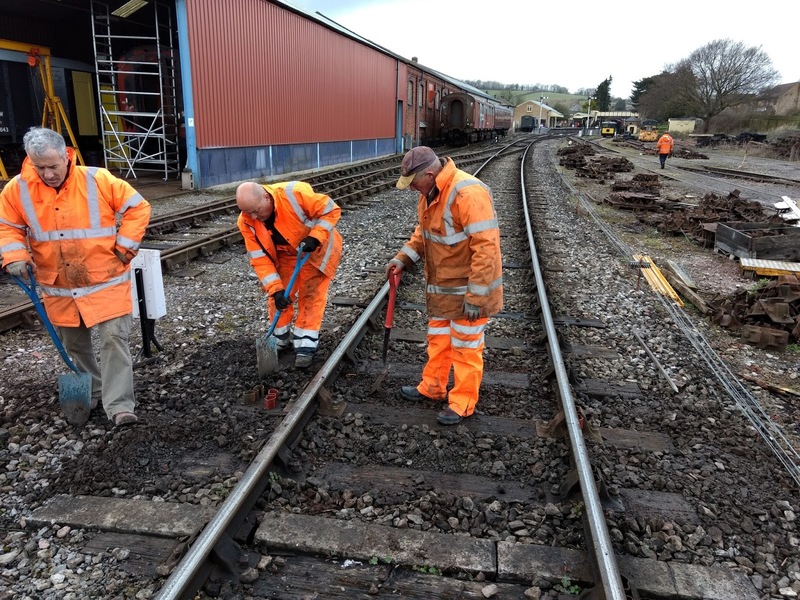 If I recall correctly some sections of track have about a foot of ballast under the sleepers - equivalent to Network Rail's standard for 125mph lines. I wonder how viable it would be to apply for an increased speed limit on this section? I can't see that there would be any issues with signal sighting (there aren't any), or traffic control (only one train is on the section at any time). The trains don't have central door locking, of course, but even that would not necessarily be a deal-breaker. 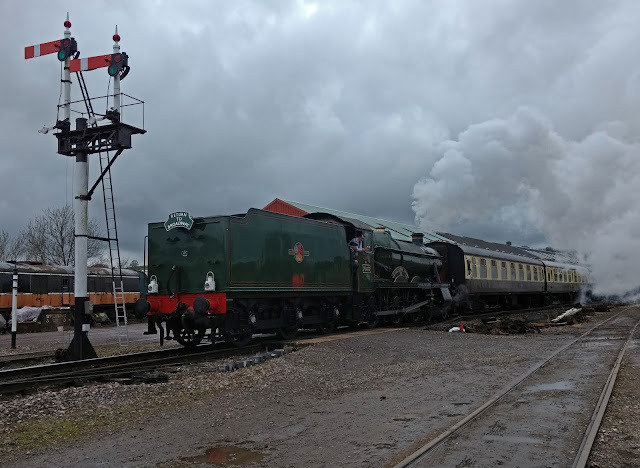 Trains are allowed to run on the National Network without central locking if stewards are on board to monitor the doors - that's how Mk1 and vintage Pullman charter stock is operated. At the very least it should be possible to raise the limit for non-passenger carrying trains, which is how the Great Central does it - 60mph for steam, 75mph for diesel. Theoretically it should be possible to get a limit of, say, 40mph for the Broadway section without having to jump through too many hoops. 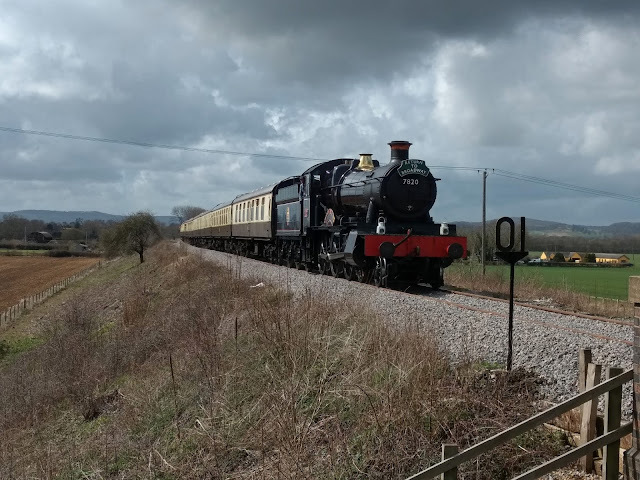 Having taken the train from Broadway to Cheltenham and back today, I can vouch that the newly-laid track on the Broadway extension is very good quality, and the ride was smooth and att 25mph seemed much more akin to being on a main line than the sprred restrictions at many points and jointed track of the Toddington to Gotherington section. I would love to see 40mph running, but appreciate that there are several foot crossings on the section north of Toddington, which might be a restriction(?). I make do with playing videos of the line on You Tube at 2x speed to give the impression of 50mph! 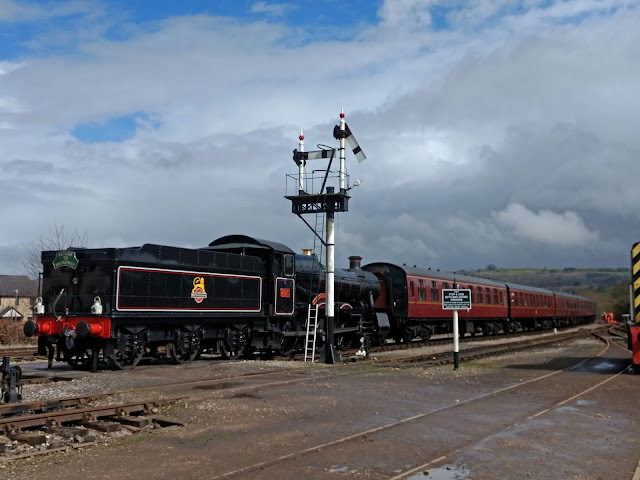 Having a long pause at Winchcombe for passing trains today, I thought that the idea of double track between Winchcombe and Toddington might be a good way to increase operational flexibility.... I know it has been suggested previously, but what are the chances? I don't think the foot crossings would be a problem. There are plenty around the national rail network, some on high speed track. 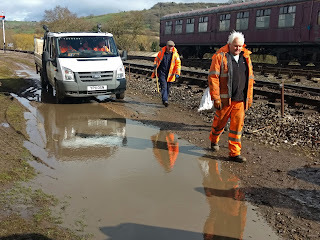 Many of them don't even have 'decision platforms', as on the GWSR - a fenced-off space which forces pedestrians to pause and look around before they set foot on the tracks. 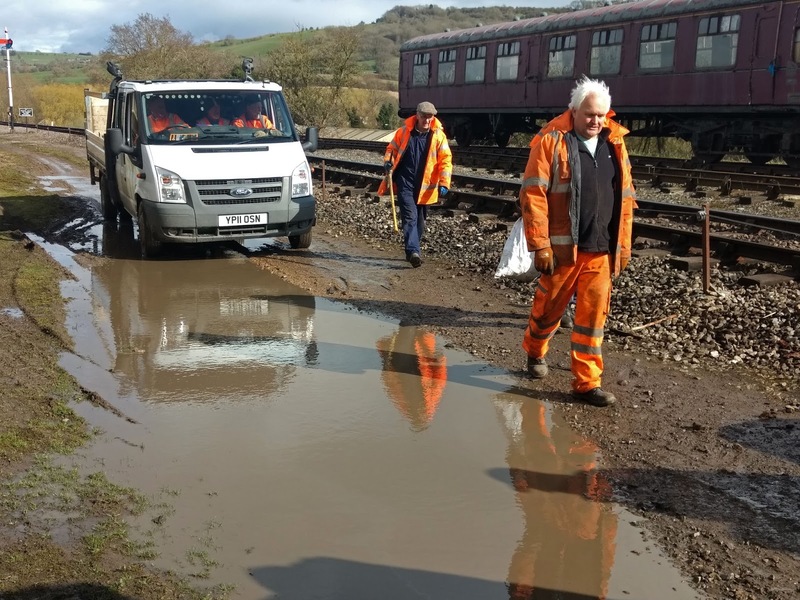 Given that the GWSR crossings are pretty much up to the latest safety standards, the relatively low use of the footpaths, and the fairly infrequent trains, I don't think they'd be an issue. Here's an example of a hair-raising footpath, on the ECML. If this is allowed, I don't think there'd be any problem on the line to Broadway! I'm told that the 10mph speed limit applies to all 'station limits' and so too to Broadway. Hello Jo, a nice long report with plenty of pictures, are you sure your not a reporter? 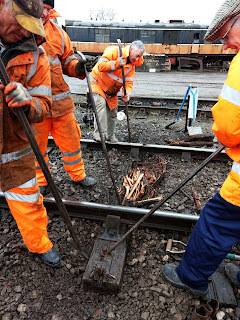 Many thanks to you all for the blog reports and pictures not only of the PW Gangs efforts but of Broadway. It was good to see Andy on this report, Are there still going to be blog reports from Broadway? (BTW, can you email me as I have a story for the notice board at Broadway and or "The Cornishman"
The ecml example does look a little scary, perhaps one to put a footbridge across!